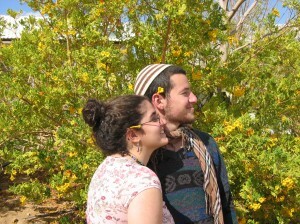 This profile is in honor of Katie Greenberg‘s upcoming wedding to Matan Glazer on March 31st. She grew up in the Bronx, and attended a Conservative synagogue in Manhattan with her family. They hosted a large, annual Pesach seder, inviting 30 of their closest friends and family; and building their sukkah at the Greenberg home in Copake every year remains a lasting, warm memory for Katie. After graduating from Bronx Science in 2004, Katie decided to defer her admission to Oberlin College for a year, and set off for her gap year in Israel. He grew up in Rehovot with an Israeli moshavnik abba (dad), and an American-raised ima (mom) who had her family join a Masorti shul, and encouraged her children to join the Noam Youth Movement. After high school, Matan enlisted in a special צהל (IDF) unit with other Noam youth, which combined community service with active army service. The group’s first assignment was nine months of volunteer work at Kibbutz Ketura. Katie returned to Israel to see Matan during the summers of 2006 and 2007; and after completing his צהל service Matan spent the summer of 2008 in the Bronx with Katie and her family, and then joined her in Oberlin for her final year of college. Meanwhile, Katie and Matan have been designing their beautiful wedding with Rabbi Ruth Kagan of Nava Tehila, as the young couple wants to develop an egalitarian, Jewish ritual that is true to their values. Again, MAZAL TOV to Katie and Matan on their upcoming wedding! We are all SO excited for you both!